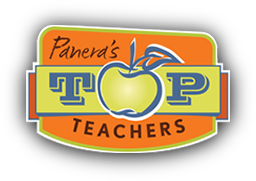 Today’s the last day to vote for me as one of Panera’s Top Teachers of Southwest Ohio! Please take two minutes out of your day to throw a vote my way? The prizes all go to my school and it could be a great thing for us! Windsor McKay drew the comic I “sampled” and it’s titled Fame Fortune and Wealth and was originally published in 1928. I felt since I used it as a teaching tool in my class… and since I was using this comic to illustrate how I use McKay’s incredible work as examples of “days gone by” for editorial cartoons. today’s the day (and tomorrow is also the day)! Please vote for me today and tomorrow! Real talk: Thanks so much to those of you have been voting. Today we moved from 4th place to 3rd place, and that’s all thanks in part to my students (who have been voting like crazy) and to the readers of this comic. You are fantastic. To those who haven’t voted- TWO days left! Please vote today and tomorrow… the prizes on this contest may seem small to some of you ($1000 dollars, two tablet computers and a couple of Panera-based goodies) but they’d be SUCH a big deal to my school, where 85% of the kids we work with are on free or reduced lunch. Brief one this week. 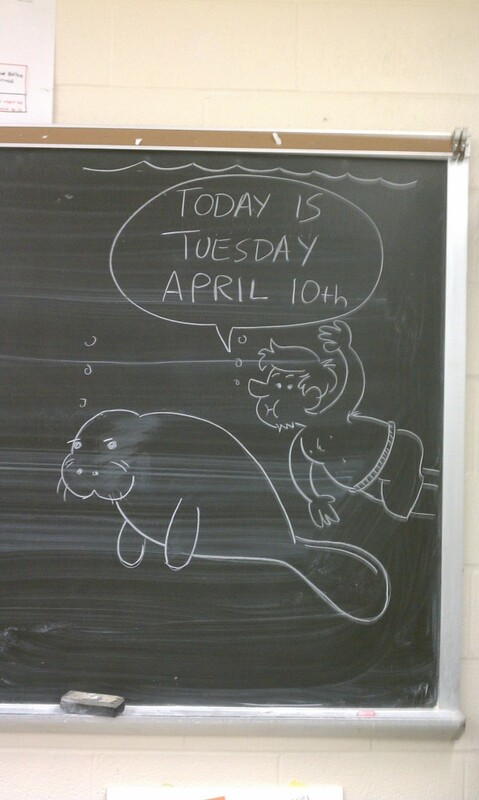 I took my kids to the zoo the Monday after Easter and decided to draw a bunch of animals on the chalkboard this week. Here’s a new one on me- I’ve reviewed novels, novelizations, and trade paperbacks… but a “video novel” is something I have never seen before. 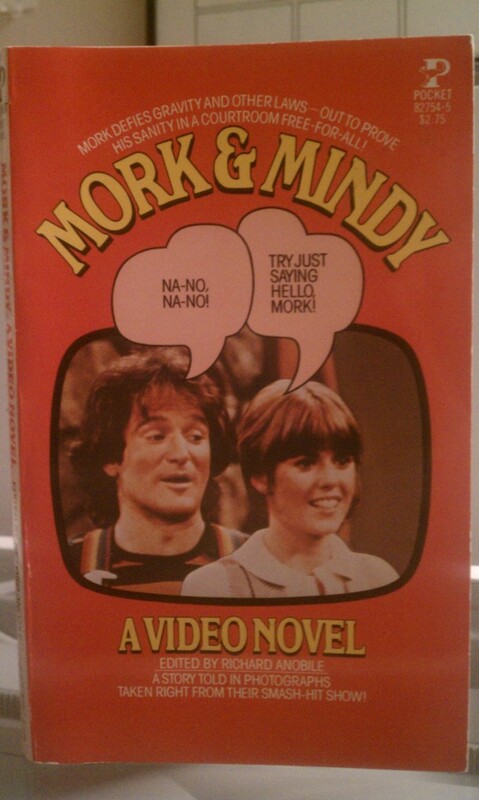 Mork and Mindy- A Video Novel, published in 1978 by Pocket Books, has about a dozen credits. Richard J. Anobile is the main credit, but of course the TV series was created by Garry Marshall, Dale McRaven, and Joe Glauberg. McRaven wrote the episode on which this book is based. This is a photo novel about Mork & Mindy, a sit-com from the late seventies best remembered for introducing the world to the exhaustive and explosive comedic talent of Pam Dawber. Can I once again ask any and all who are reading this to take two minutes out of their day to go over and vote for me as one of Panera Bread’s Top Teachers of Southwest Ohio? So many of you have been so generous with your support and votes- I shot up to FOURTH place yesterday. Please keep voting over the next four days… and ask your friends and family to do the same! These past two weeks were, without a doubt, some of the toughest weeks of comics to produce. Call it inertia from taking two weeks off for spring break, call it some kind of writer’s block… whatever. I’ve had a VERY hard time getting myself back on track; being perfectly honest with you, I’m not sure I am in fact, back on track. I’m somewhat reassured to remember this happens to me every year, as my classes march toward the end of the school. The less time we have in the classroom, the less motivated I am to talk about my classes, lessons, and students. Having said that… last year, I did an even 100 comic strips about the 2010-2011 school year and then called it quits. Already this week, I’ve beat that “record” and have plans for about eight to ten more strips before the end of the year. I am relatively sure this sort of process blather is of interest to no one but myself but I thought it merited writing, even if it’s only to use this as some sort of arbitrary measure of having gone over the number of teacher comic strips I did last year. Whee! A further commentary on my lack of motivation: my leisure reading has taken a HUGE hit in the past few months. I’m not sure when this started but sometime around March, I became unfocused and inattentive to the pile of books slowly growing on my bedside table. Oh, I was still READING of course… I just did some comfortable re-reading of already loved novels and comics instead of breaking new ground. I’m currently working my way back through Justin Cronin’s post-apocalyptic vampire opus The Passage and I’ve been enjoying breezing through some of my old issues of Image Comics’ Invincible. It’s not that I don’t have exciting new books to read. I have the second Jackson Brodie mystery patiently awaiting a look; I waxed rhapsodic about Case Histories back in March. I should be excited for One Good Turn. Lauren Groff’s Arcadia is another book I really want to check out; I loved The Monsters of Templeton. I just can’t seem to work up a good head of steam. Hopefully something gives soon! 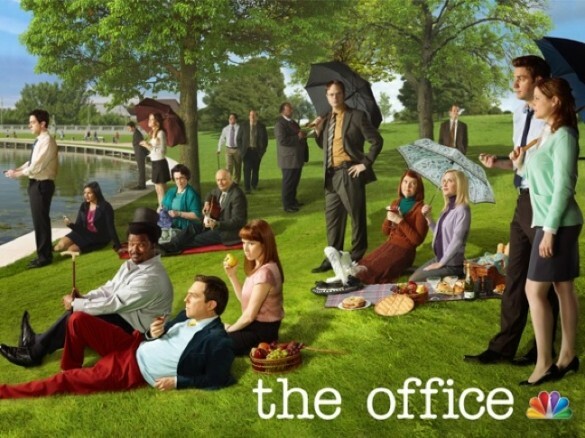 As a guy who was a fan of the series in its’ early days, I’ve been weirdly fascinated with how unmoored and inconsistent NBC’s The Office has become this season. Granted, with the loss of Steve Carell last year, this was always going to be a transitional season for the show. You are currently browsing the Teachable Moments blog archives for April, 2012.